An all-in-one Temperature Surveillance Module provides total security for blood and plasma products. 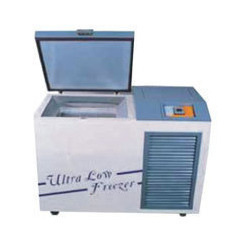 Plasma freezers are the Inner chamber made of stainless steel (SS-304) and outer chamber made of mild steel duly powder coated. Plasma freezers are foamed in place CFC Free PUF insulation ensure temperature stability and reduced energy temperature. Suitable for research laboratories blood banks, biological and industrial application. Complete IQ, OQ, and PQ documentation & operating manual. Magnetic door gasket air Sealed Compressor. Volume 90 LTRS. 185 LTRS. Establish in January 2001 at Vasai Road Thane, Deep Instruments is a well known manufacturer and supplier of a wide range of products which include Blood Collection Monitor, Blood Bag Tube Sealer, Twin Balance Scale, Plasma Freezer, Deep Freezer, Blood Bank Refrigerator, Plasma Agitator etc. Within the short span of fifteen years concern entered and started manufacturing quality products for pharmaceutical industries. All these products are manufactured by a team of qualified engineers, who are highly experienced in their respective field. All the products are manufactured under strict quality control to ensure global standards. The manufacturing activities are carried out in its own premises. Prompt after sales service is also a main criteria of the concern.